Kali, whose name means “the black one,” is the Hindu goddess associated with time and change and is the deity Shiva’s bloodthirsty companion, said to be a ferocious slayer of evil. 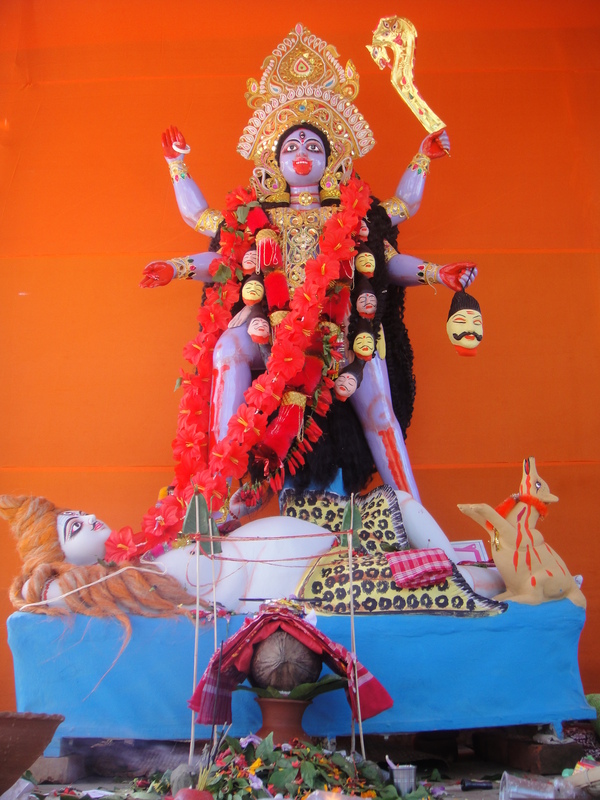 According to legend, Kali looks after those who satiate her bloodlust by bringing wealth to the poor, revenge to the persecuted, and children to the infertile. Two hundred years ago, worshippers sacrificed a human boy every day at a Kali temple in Calcutta, India, but today human sacrifice is illegal and animals must suffice (Nevertheless, a three-year-old and 15-year-old boy were hacked to death recently by their parents in a secret ceremony for Kali in India). 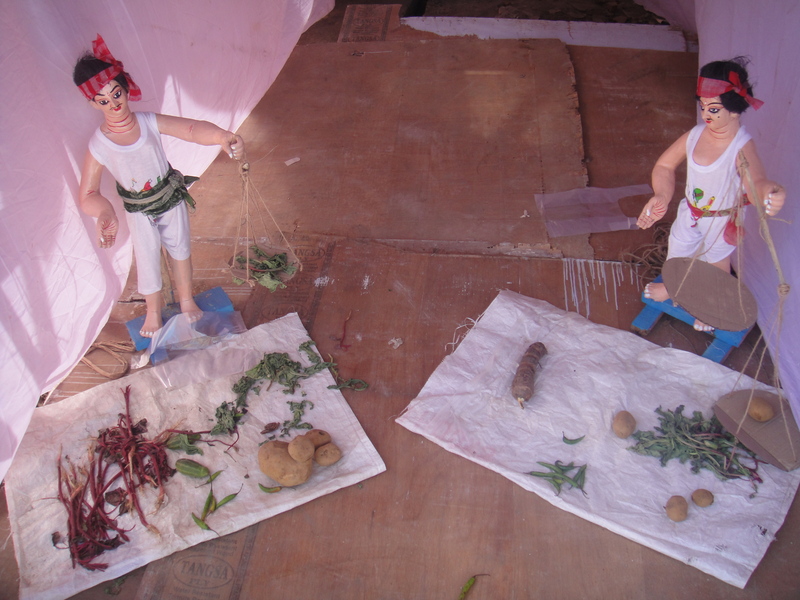 We have tried our best to curb human sacrifices, but what can an agency do when an entire village chooses a victim and cuts off his head with his parent’s consent? Human sacrifice under our law is treated as murder, but the killer – never found – is always the local high priest. At times the local policemen are reluctant to take action because of the inbred fear of the gods and goddesses. 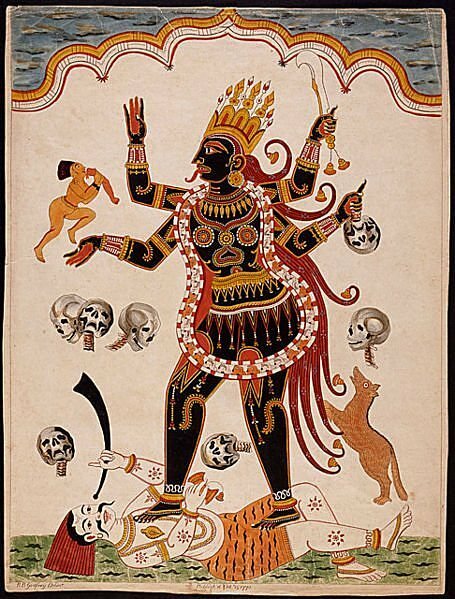 Kali is most often depicted with black skin and four arms, wielding weapons and severed limbs. She wears a necklace constructed of human skulls. A skirt of human limbs from those she has destroyed, hangs around her waist. Her long black tongue hangs out of her mouth, dripping with blood and she’s usually carrying a severed head in one of her four hands. Kali’s thirst for blood supposedly originated in her killing of the great demon Raktabija. Raktabija had a magical ability; every drop of blood that fell from his body was able to create thousands more demons like him. Kali destroyed him by piercing him and drinking all of his blood as it gushed out. They were the very incarnation of evil in Indiana Jones and the Temple of Doom. Their name is the root of the modern English word ‘thug’. And a few centuries ago these bad boys were responsible for the mass murder of at least tens of thousands of travelers (The Guinness Book of Records credits them with two million kills). India’s mystery-shrouded Thuggee cult were bands of roving stranglers who robbed and killed many people making their way unwittingly across the sub-continent. The motive for the robbery is self-evident, but the killing was all about Kali. All victims of the Thuggee were sacrificed to Kali, and the members of the secret society would have been greatly incensed by an accusation that they killed only for loot. And strangling was the only permissible way to kill… The strongest rule of the Thuggee brotherhood was one prohibiting the spilling of blood. According to Thuggee beliefs, the goddess Kali taught the fathers of thuggery to strangle with a noose and to kill without permitting the flow of blood. The British eventually mopped up most of the Thuggee and the resulting trials brought out a number of interesting details. A band of 20 confessed that they had participated in 5,200 murders. A Thuggee named Buhram, who had been a strangler for 40 years, had the highest lifetime score to his discredit—931. When asked if he experienced any feelings of remorse or guilt, he answered sharply that no man should ever feel compunction in following his trade. The Thuggee had their female counterparts in a secret sect of Tantrists who held that it was only by a constant indulgence in passion that a human could ever achieve total union with Kali. Only indulgence in the five vices that corrupt the soul of humankind— wine, meat, fish, mystical gesticulations, and sexual indulgence—could drive the poisons out of the human body and purify the soul. Tags: Dibrugarh, India, Justin Ames, Kali, Tantrists, Thuggee, Thugs. Bookmark the permalink. 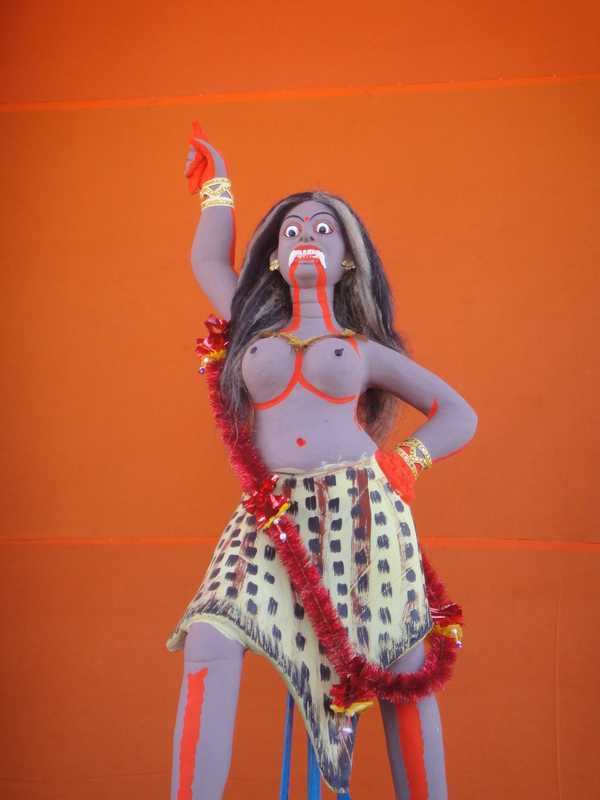 The Western hemisphere is a whole world of misconceptions about Mother Goddess Kali. Really, one single Hindu diety isn`t all that bad. It just depends on what perspective you approach her from. As far as Indiana Jones and the Temple of Doom goes, the perspective of reverence is definitely missing! I,m coming to get you Kali. The Righteous One.